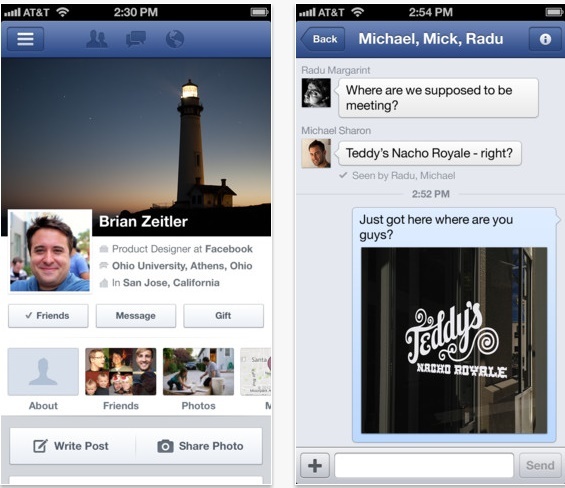 Facebook v5.4 for iOS with voice and video recording. As happened with the version of Facebook for Android , The people of Facebook has updated its official application for mobile devices with iOS , compatible with the iPhone, iPad and iPod Touch having iOS 4.3 onwards, which comes with interesting news as support to send voice messages and record video from within the application, so you can send voice messages even if your contacts are offline, and share the videos you shoot with your iPhone, iPad and iPad touch in a more rapid and improvements performance and bug fixes. Stay in touch with your friends faster than ever. Receive notifications when your friends comment on your posts or mark like. Send SMS, chat and group discussions. Play and use your favorite applications. Share your stories with voice and video recordings in the application. Send voice messages when you have more to say. Record and share videos from your application. Share and connect with your favorite places using the tab "Close to you" improved. Free download from the App Store | Facebook 5.4 for iPhone, iPad .